New Phurpa Releases Ready to Ship! 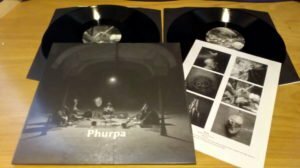 Phurpa return with two massive releases on Oaken Palace Records – more than 3 hours of material spread over a double LP and a super-long cassette tape. The vinyl album (get it here) is a beautiful tapestry of ancient sounds, with varied passages of communal vocals complemented with singing bowl, rattle and traditional drums, over the faint organic hum of the ritual space. 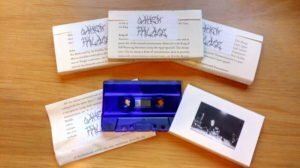 The cassette (get it here) presents an astounding extended mantra, a single recording lasting one hour and forty-four minutes, on specially extended C105 cassette. These releases together comprise a staggering dark mass of ritual drone, austere but richly dense, relentless but profoundly meditative. Sacred Sounds 18.12.16 (2LP) will be dedicated to the Amur leopard, (Panthera pardus orientalis) the most endangered big cat on this planet, with only 70 individuals remaining in the wild. Sacred Sounds 22.1.17 (tape) will be dedicated to the Amur tiger, (Panthera tigrus altaica) which came to the brink of extinction in the 1940s, and is only slowly recovering. All profits will be donated to the Amur Leopard & Tiger Alliance (ALTA). 2LP, 79 min 52 seconds, 2LP, edition of 500 on 140g black vinyl. 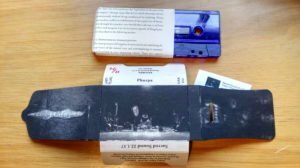 Tape, 104 min 54 seconds, edition of 150 on C105 purple cassette, of which 25 are hand numbered with special screen-printed cases.